Finally, after almost four years in Scotland, I've found the perfect boots for this wet country. Rain boots ("Wellys") are fine - in the spring - but what about in the winter months when it's wet AND cold?! 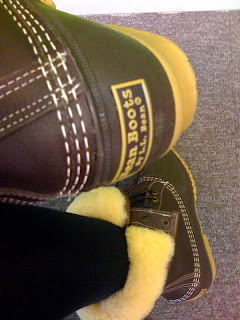 These shearling-lined Bean boots are fantastic! After emailing my Mom the link, I showed Paul the boots online. 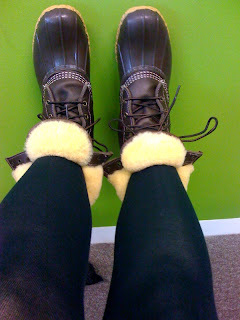 Naturally, he thought they were hideous and remarked that I would look like a mad woman walking about Glasgow in them. He's a boy so really, what does he know about being on the forefronts of fashion? Doesn't he know that Marc Jacobs - one of the most influential designers of our time - has released his own version of Duck Boots?! What's wrong with Dr Martens or Berghaus? Nothing. I wanted LL Bean boots. Looks like you were climbing the wall to get the boots - very smart.